Review: The Joker wreaks havoc and chaos on the people of Gotham. Batman’s ongoing war on crime and his battle with the psychotic Joker. A fantastic second film to the trilogy. In order for them to make sense you have to see all of the films in order. 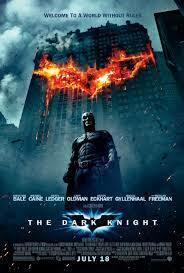 Batman Begins, The Dark Knight and then The Dark Knight Rises. Not the best of the three. Found the film to be a bit too long. Great performances. I enjoyed watching Aaron Eckhart doing a completely different role to his usual (usually in rom-coms). This just shows what a good actor he is. Heath Ledger designed the Joker make-up himself. He stated in an interview that the Joker was his favorite role. This is the first Batman film where Batman operates outside of Gotham. According to the BBFC this film received the most complaints of the decade from British viewers in 2008. This is the first Batman feature film that doesn’t incorporate the word ‘Batman’ in its title. At the Academy Awards in 2009 this won 2 Oscars. They were for Best Performance by an Actor in a Supporting Role (Heath Ledger) and also Best Achievement in Sound Editing. At the Golden Globe Awards the same year it won Best Performance by an Actor in a Supporting Role in a Motion Picture (Heath Ledger). At the Bafta Awards also the same year it got the Best Supporting Actor Award (Heath Ledger). This is on Barry Norman’s list of 100 Greatest Films of all time that he produced at the start of 2012.